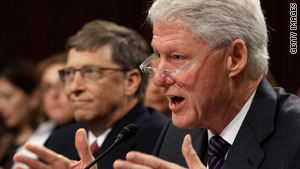 Microsoft Chairman Bill Gates, left, and former President Clinton testified in Washington on Wednesday. They talked about why global health should be important to U.S.
Washington (CNN) -- Aside from a moral obligation, improving the health of people in other nations is smart foreign policy, former President Clinton said Wednesday. "We live in an interdependent world in which we have learned the hard way that no matter how brilliantly our forces perform, we can not kill, jail or occupy all of our adversaries," he told the Senate Foreign Relations Committee in discussing why the issue of global health should be important to the United States. "We have to build a world with more partners and fewer adversaries," Clinton said. "That's what foreign policy's about. ... If people think you care whether their children live or die, you don't have to send our young people off to war as often." He and Bill Gates, chairman of Microsoft and co-chairman of the Bill and Melinda Gates Foundation, testified on global health before the committee. Clinton established the William J. Clinton Foundation, which works on global programs including the Clinton HIV/AIDS Initiative. In his opening remarks, Committee Chairman John Kerry, D-Massachusetts, said that U.S. work on global health issues should be strongly bipartisan, such as President George W. Bush's Emergency Plan for AIDS Relief and the reauthorization of the measure in 2008. Kerry also said the Obama administration's proposed global health initiative has identified principles that should guide U.S. thinking on the matter: Looking beyond the "vertical silo" of any one disease; focusing on women and girls, who are at the "center of each family's health"; and empowering other countries to eventually assume full responsibility for their citizens' care. Kerry said the administration is "finalizing" the initiative. "A strong global public health system is not merely a favor we do for other countries," Kerry said. "It is the right thing to do morally and strategically, and it protects our own citizens." Gates and Clinton acknowledged budget restraints in providing care to people around the world but said the work was important. Gates said he hoped that Congress will be able to increase the funding for vaccine allocation and for the Global Fund to Fight AIDS, Tuberculosis and Malaria, a financial organization that organizes and distributes resources to fight the diseases. "This is very, very important work. We have evidence about the great impact that these investments have. We have a chance to increase them and make them more effective," Gates said.